Merry Christmas and best wishes for a joyful Holiday Season from the entire Staff at Arlington Camera! We’d like to invite you to our annual “Christmas at Arlington Camera” two day OPEN HOUSE and spirited Holiday Celebration. Please join us for this great opportunity to talk directly with our Reps, as well as enjoy the benefit of Special Pricing or Rebates on cameras, lenses, tripods, bags, straps, smart phone photo accessories, video gear, and so much more! Visit our Photo Chicks Boutique area for wonderful gift ideas, too! And did we mention Free Gift Wrap, Yummy Refreshments, Special Giveaways to the first 10 customers each day, and Door Prizes to be awarded throughout both days! In addition, THANK YOU for SHOPPING LOCAL! Our knowledgeable and friendly Staff is always available and more than happy to assist you with all of your photographic and gift giving needs - before, during, and after your purchase. Don’t miss out on the valuable opportunity to meet and speak with Representatives from several of our camera and photo gear companies. The Reps will be in the store on Friday & Saturday for demonstrations and to answer your photographic questions. 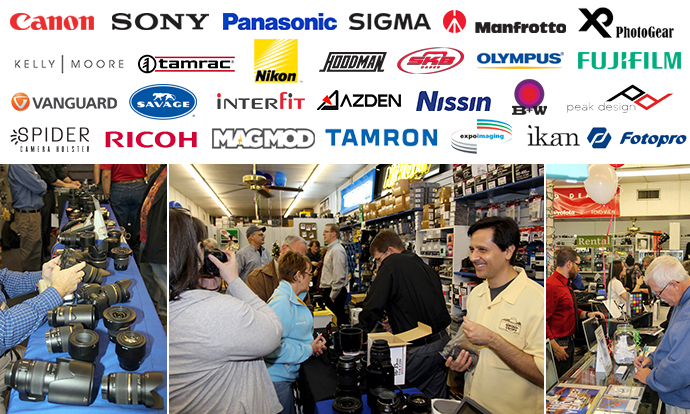 Justin Camp with US Camera Pro will be in the store both days to offer you cash for your used camera gear. If you wish to spend your profits at Arlington Camera during this event, Justin will add an extra 10% to the value he offers you! Studio Lighting will be available in a small area that will be set up for demonstration purposes as well as hands-on experience. This is a wonderful opportunity to learn from some of the very best in the photo industry! You’re invited to bring your camera, your family & friends, or even bring a favorite pet, and take advantage of this fun chance to learn from our talented Reps and take a Christmas themed photo, too! ‘Tis the Season, and especially at this time of year we just LOVE to give stuff away! Register to win one of many Door Prizes that will be awarded at this event. You’re welcome to hang out with us as long as you wish, but you need not be present to win. Not sure about what to give your favorite shutterbug? Consider a Gift Card from Arlington Camera! It’s the perfect present that never expires! As a special bonus, during our two day event you’ll receive a free “Spudz” lens cloth with the purchase of a Gift Card valued at $25 or more. Instant Stocking Stuffer! Yay! Our Elves are happy to Gift Wrap your Gift Card or other Arlington Camera purchases so they’ll be ready for you to put under the tree! Let us help reduce your holiday stress! HO! HO! HO! We will be closed Christmas Day to spend time with our families. Our sincere wish is that you will also be able to have the time you need to do the same! Please join us for our special Open House as we joyfully celebrate this most wonderful time of the year! We hope to see YOU at Arlington Camera!